All lockrods are not created equal. What makes ours superior are our unique designs and quality manufacturing processes. Powerbrace has been the premier manufacturer of heavy-duty door securement systems for over 50 years. We offer more lockrod models than any other manufacturer in the world. We deliver superior components and workmanship. Powerbrace factory assembled lockrod models are manufactured to exacting standards and are tested to AAR Specifications for U.S. and Canadian trailers and domestic containers. All Powerbrace lockrods meet or exceed end-wall force requirements prescribed by the American Association of Railroads (AAR). AAR specifies minimum door locking strength to prevent cargo spillage that can result from the pressure of shifting loads against the inside of the door. Powerbrace door hardware is tested to AAR M-930 (for containers) and M-931 (for trailers). 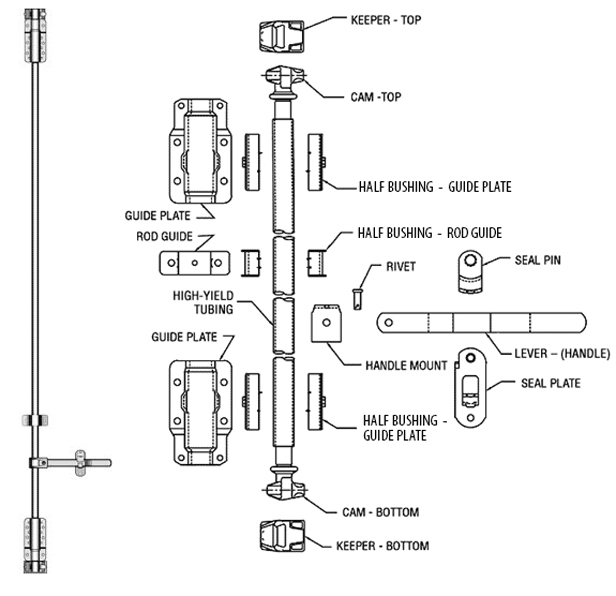 Lockrod assemblies are typically welded complete with top and bottom cams and lever assembly. Lockrods may be ordered with the top cam unattached for field length adjustment (Top End Loose TEL). Keepers, specific to the model, are ordered separately with desired offset, material and finish. All our lockrod models feature heavy-duty high-yield (55,000 psi minimum) low alloy tubing for maximum strength, long life and optimum performance. Standard finish is Hot-dip Galvanized, but other finishes are also available. “Snap-in” Acetal anti-seize bushings used with guide plates and rod guides allow easy assembly and smooth operation and prevent galling and eliminate the need for lubrication.